Most of the essays are very short. A couple of Kindle-pages in length for some of them. And actually, most of them don’t really offer any new insight or comparisons. Anyone who spends time on Facebook will encounter much of the discourse that is here (though perhaps without the vehemence and inciting rhetoric). None of these essays/articles stood out as exceptionally keen or insightful – as I say…this discourse is already taking place on social media and in various presses (which is where these come from). But the advantage is that Perkins has gathered a number of them and brought them together. One of the more interesting, or at least daring, articles was “Why Orwell’s Sudden Best-seller 1984 is More Applicable to Obama Than Trump” by Jay Strongman. One of my least favorite pieces (surprisingly, perhaps, given my ‘other’ job in the professional theatre, was “Orwell in America — The Play” by Joseph Sutton which, first of all, was only the beginning portion of the play, and secondly, wasn’t all that interesting. And of course there’s no small part of this that is taking advantage of the tremendous, sudden interest in Orwell’s 1984 and the sitting U.S. presidency of Donald Trump. Thanks to ebooks and print on demand, it’s much easier for writers/editors/publishers to get books in front of the reading public very quickly. Looking for a good book? 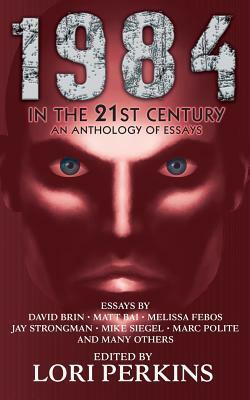 If you are a fan of George Orwell’s 1984, or concerned about how much like 1984 our political system has devolved to, you may enjoy the insight, thoughts, and concerns expressed in the series of brief essays collected by Lori Perkins in 1984 in the 21st Century.